(NaturalNews) The activity of a specific pain receptor may be behind the beneficial effects of chili peppers on metabolism, according to a study conducted by researchers from the University of California-Berkeley and the Salk Institute for Biological Studies in La Jolla, Calif., and published in the journal Cell on May 22. Blocking that pain receptor (as frequent exposure to hot peppers seems to do) was found to lengthen the lives of mice, improve their insulin response and keep their metabolisms young. Previous research has shown that mice which lack the pain receptor TRPV1 are less likely to become obese, indicating that the receptor plays some role in regulating metabolism. TRPV1, found in the nerves, skin and joints, is sensitive to painful stimuli such as extremely high temperatures. In the nerves that connect to the pancreas, TRPV1 is known to stimulate the release of chemicals that prevent the release of insulin and cause inflammation. This implies that the sensation of pain may actually cause more inflammation and higher blood sugar levels, two risk factors for diabetes and cardiovascular disease. In the current study, researchers found that mice which had been genetically engineered to lack TRPV1 lived about 14 percent longer than non-engineered mice. They also had lower levels of CGRP, a peptide that TRPV1 stimulates the pancreas to produce in order to block insulin release. These low levels of CGRP were linked to a more youthful metabolism, even in old age. Specifically, the bodies of low-CGRP mice rapidly cleared sugar from the blood, rather than demonstrating the slower sugar-removing response associated with aging. The mice also seemed able to burn more calories with less exercise. The researchers then treated non-engineered mice with an anti-migraine drug known to inhibit CGRP. They found that the effects of this drug were similar to those seen in the genetically engineered mice. In fact, when old mice were given the drug, their metabolisms actually became more youthful. "Our findings suggest that pharmacological manipulation of TRPV1 and CGRP may improve metabolic health and longevity," senior author Andrew Dillin said. "Alternatively, chronic ingestion of compounds that affect TRPV1 might help prevent metabolic decline with age and lead to increased longevity in humans." The research institutions involved in the study have filed a patent for the technology used in their research. "We think that blocking this pain receptor and pathway could be very, very useful not only for relieving pain, but for improving lifespan and metabolic health, and in particular for treating diabetes and obesity in humans," Dillin said. "As humans age they report a higher incidence of pain, suggesting that pain might drive the aging process." A university press release noted that capsaicin, the chemical which gives chili peppers their "hotness," is known to activate TRPV1. In fact, the two are so strongly connected that TRPV1 is often called the "capsaicin receptor." The press release notes that constant activation of TRPV1 can actually lead to the death of nerve cell that the receptor is found on, perhaps mimicking the complete absence of the TRPV1 receptors. This might explain why research has linked diets high in chili peppers to lower rates of diabetes and other metabolic problems. Some clinical studies have also implied a direct effect of capsaicin on metabolism. For example, a study published in the Journal of the Medical Association of Thailand found that people who consumed a sugary beverage mixed with chili peppers had a significantly lower increase in their blood glucose levels and a significantly higher metabolic rate than people who drank the sugary beverage alone. 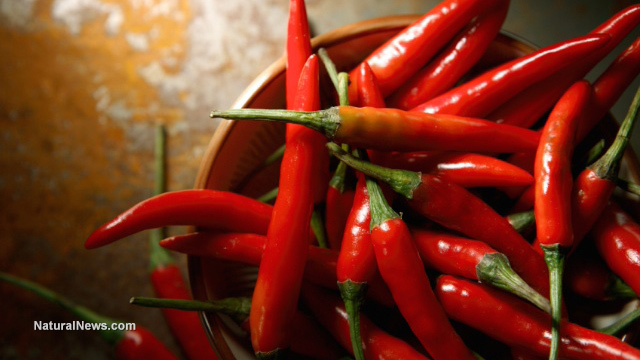 Other studies have linked chili pepper consumption to weight loss.